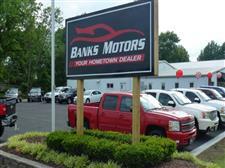 Banks Motors offers Preowned Trucks & SUV's in outstanding condition. We provide the most stress-free buying experience while building lifelong customers who can count on us to provide great pricing along with our unique Customer Service and Inventory. Our dedicated sales staff is eager to make this your best buying experience yet. Best truck buying experience l have ever had, great group of people! Great Experience, did what they said would do. Got a great vehicle at a good price. Dallas was awesome in helping me get it done and very responsive without being pushy. "The nicest people to deal with. They make buying easy and simple! We had a great experience with them and will definitely be repeat customers!" Exceptional crew at Banks Motors! Couldn't have asked for better service! These guys are top notch and take excellent care of you! If you're vehicle shopping and dread going into dealership after dealership, don't hassle with all that jazz, just go to Banks! I bought a CLEAN 15 Silverado Diesel here and I got a good price on it and I couldn't be more happy with this purchase. I will never buy a vehicle anywhere else! Dana and the guys were so damn cool too! EASIEST QUICKEST PLACE TO BUY A CAR EVER!!! THEY EVEN FINANCED ME!!! Shane was very helpful although we weren’t able to get together on the rate . He tried his best to make the deal work. Dana always makes truck buying easy but when I bought my 2015 F150 King ranch from them it was one of the easiest and fast transactions I had done so far. That is how vehicle buying should be like. Thanks Dana! Highly recommended!!! !